National Healthcare Volunteer Week is an extension of National Volunteer Week established in 1974 by President Richard Nixon to recognize and celebrate the efforts of volunteers across the country. The week has become a nationwide effort to urge people to get out and volunteer in their communities. Volunteers are the backbone of our hospitals and health systems. Volunteers play an integral role in advancing patient outcomes and quality care. Their service to patients and communities helps improve care and promote collaboration among not only hospitals, but health systems and community groups, as well. This year National Healthcare Volunteer Week will take place April 7-13. Take this opportunity to make a splash and demonstrate to your volunteers your avid appreciation for their efforts to advance your facility. Say “Thank You” with branded gifts. Promotional products can play a key role in retaining your valued volunteers as a part of your facility. This in turn can help increase overall patient experiences and brand impressions over time. We’ve got the perfect branded gifts designed to showcase your appreciation for all the hard work and perseverance your volunteers show every day. 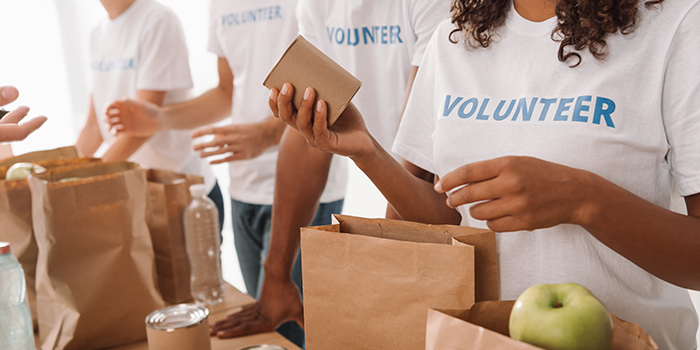 Volunteers keep your organization going. Now it’s your turn to keep them going. Whether it’s hot coffee, ice cold water or anything in between, be sure your volunteers always have what they need on hand with branded drinkware. Because there’s really no better way to say ‘Thank You’ than with snacks! The way to their hearts is through their stomachs, so spread the message of your heartfelt thanks in the tastiest way possible. Take notes: one of the best ways to demonstrate your gratitude for your staff is to give them items they’ll use every day. Gifting writing sets not only shows your appreciation, it shows an understanding of their daily needs. We’ve got thousands of products designed to highlight your appreciation for your valued volunteers. Contact your Staples Representative today to learn more about how you can show appreciation to your valued volunteers during Healthcare Volunteer Week.